The Chanterelle String Quartet draws its members from the string sections of the Sydney Symphony Orchestra. Each of the members has a passion and love for chamber music. They have performed in the Utzon Room at the Sydney Opera House, Sydney Mozart Society, Delmar Series, SSO Night Lounge, Vanguard , ABC Sunday Live, for many Sydney Music Clubs and for prestigious SSO events. The Quartet made its debut presenting a Concert in the Sydney Symphony Orchestra Spring Chamber Music Series in 2010. The programme will feature the String Quartet in E minor op 44 no 2 by Felix Mendelssohn, as well as works by Frank Bridge and Stephen Lalor. Fiona Ziegler began her violin and piano studies with her mother, violinist, Eva Kelly, later studying violin with Christopher Kimber and Harry Curby, piano with Nancy Salas and cello with Lois Simpson. Fiona, also a prominent baroque violinist, has performed with Ensemble de la the Reine, The Marias Project, The Sydney Consort, Concertato, The Australian Forte Piano, the Renaissance Players and the Australian Brandenburg Orchestra. She has also performed regularly with The Sydney Chamber Choir, Coro Innominata, the Sydney Soloists and has led the Sydney Philharmonia since 1992. 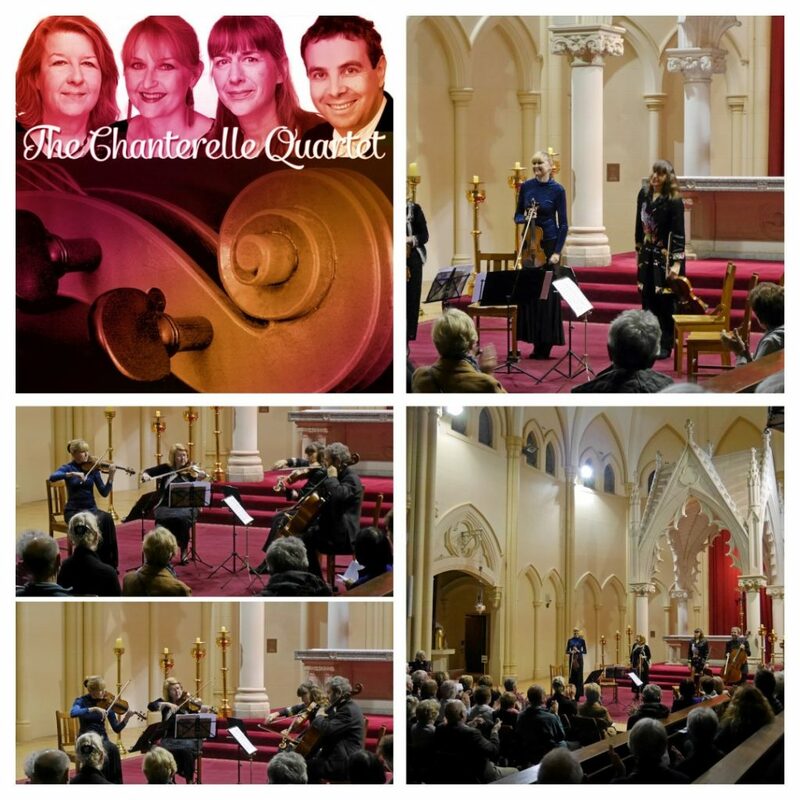 As a chamber musician Fiona has performed with the Gagliano String Quartet, the Sydney String Quartet. Trio Pollastri, the Vuillaume Trio, Josie and the Emeralds on Tenor Viol, the Grevillea Ensemble, and Plektra and Completely Plucked on mandolin and mandola. Fiona has been an Assistant Concertmaster of the Sydney Symphony Orchestra since 1995 and plays on her mother’s 250 year old Testore violin. Leone Ziegler also began her piano and violin studies with her mother Eva Kelly. She gained her B Mus studying with Robert Pikler, Harry Curby and Nancy Salas. During this time she was leader of the Australian Youth Orchestra and twice winner of the State finals of the ABC Concerto Competition. After working with the Australian Chamber Orchestra she was appointed to a first violin position in the Sydney Symphony Orchestra. After being awarded numerous Scholarships in 1984 Leone studied in London with Frederick Grinke and Manny Hurwitz attended a summer school in Switzerland with Pierre Amoyal. Subsequent SSO sponsored scholarships were taken in 1991 and 2012 with David Jurwitz. She has worked with the AOBO, Seymour group and the Australia Ensemble and was a founding member of the Gagliano String Quartet. Jane Hazelwood studied at the Sydney Conservatorium with Alexandru Todicescu. From 1983 to 1986, she furthered her studies with Wolfram Christ in Berlin where she played regularly as a casual with the Berlin Philharmonic Orchestra. In 1986 Jane returned to Australia to become Principal violist of the Australian Chamber Orchestra. Jane has also performed with the Philharmonia Orchestra of London, the Australian Chamber Soloists and the Australia Ensemble. Jane is currently a member of the Sydney Symphony Orchestra and plays as a guest artist with various chamber music ensembles. Apart from her performing commitments, Jane is a dedicated teacher. She was String Lecturer at the Victorian College of the Arts and a teacher at the Sydney Conservatorium. She is a regular tutor at the Riverina Summer School for Strings. Adrian Wallis graduated from the NSW Conservatorium of Music in 1988, where he studied with Lois Simpson, Susan Blake and Georg Pedersen. He then undertook postgraduate studies in Europe and the UK with Christopher Bunting before returning to Sydney where he worked for several years as a freelance cellist. During this time he played regularly in the Australian Opera and ballet Orchestra, Australian Chamber Orchestra, as guest principal with the West Australian Symphony Orchestra and as principal cello for the Bolshoi Ballet in Australia. He joined the SSO in 1999. In addition to his extensive experience in the commercial field, he has played solo cello in various productions for the Sydney Theatre Company, Sydney Dance Company and Belvoir Street Theatre. A former member of the contemporary music ensemble Symeron as well as the Elektra String Quartet, Adrian has also performed with the Seymour Group, Ensemble 24 and at the Sydney Spring Festival.